Pregnancy Acne: Cause For Serious Concern? Once a woman leaves her teen years behind her she is relieved that her battles with pimples, acne scars and acne breakouts have finally ended. However, the truth is that more than 50% women are believed to have experienced adult acne problems at some time in their lives. Frequent acne breakouts are also a regular and extremely common phenomenon with pregnant women. Pregnancy acne can be a serious concern that needs to be dealt with urgently. Symptoms of pregnancy and teenage pimples have the same basic cause - a change in hormone levels (there are some other causes of acne too). In pregnancy acne, the maximum number of pimples appears in the first three months due to an increase in hormones, which increases oil production by the sebum glands and blocks the pores. Pregnancy acne is distinguished by acne lesions around the mouth, back, chest and shoulders. It is generally believed that those who were troubled with acne during puberty are more susceptible to acne during pregnancy but with the rise in estrogen levels as the pregnancy progresses, the acne starts clearing up and sometimes even disappears totally. · Wash your face twice or thrice a day. · Maintain the right water balance in your body by drinking plenty of water. · Do not touch or pick existing pimples as this causes the bacteria to spread. · Sleep a lot to keep your skin refreshed and healthy. Today doctors advise women to live with pregnancy acne since it is a temporary phenomenon. Over the counter anti acne creams are not recommended because they harm the unborn baby even if used one month prior to conceiving. The cream is absorbed by the skin and passes from the mother's bloodstream through the placenta into the babies' bloodstream. This creates toxicity in the newborn leading to jaundice, anemia and even physical abnormalities. Avoid any medication that contains tetracycline (an oral antibiotic that causes discoloured teeth and poor bone growth in babies), salicylic acid, tretinon or isotrentinoin (known to cause miscarriage, infant death, hearing disabilities and birth defects. ).Sulfacetamide, Adapalene and Azelaic acid found in anti- acne creams increase toxins in the baby's bloodstream. Doctors prefer to prescribe minimal medicines and generally recommend topical medicines containing benzoyl peroxide. Would you still like to risk damage to your baby just so that you have a pimple free face? No? 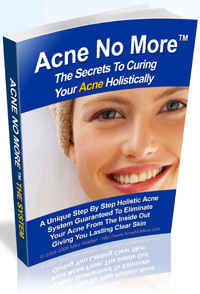 The only way to ensure this is by following the holistic approach which advocates healthy changes to your lifestyle to restore the balance in your body and prevent pregnancy acne. The holistic approach treats the body as a whole, identifies all the contributing causes of acne and then fights them all individually. And the results are quick, safe and permanent. Yes, pregnancy acne can be best solved with the holistic approach.